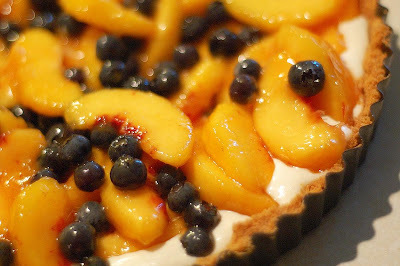 blueberries and peach combination rocks! Add cream cheese to it and its fantastic! I've always wanted an excuse to buy a tart pan ! This looks fantastic! 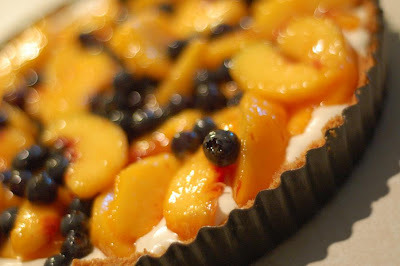 I'm going to have to make this because I've been stuck on Ina's peach crumble since we made it for Barefoot Bloggers. This looks soooooo good. And refreshing. I will be making this today!! It looks delish!! we've had peaches here for close to a month now so i'm always looking for something new to do with all the peaches i keep buying because they look so good. I'm dying to make this! Sounds super!